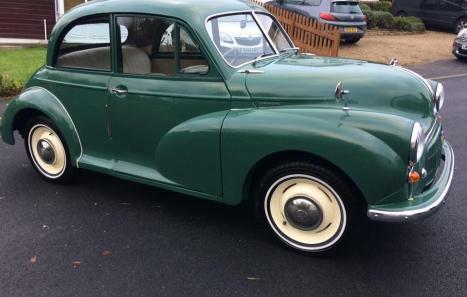 This is a two owner from new 1951 Morris Minor Series 1 Split screen. It is a rare car indeed with the 'cheese grater' grill and it is sporting the correct type early side valve engine. The car will be be sold serviced including new distributor, points, plugs and leads. It is in excellent order throughout. This car is known to the MM register. Having been restored over a number of years by an enthusiast with a great eye for detail, this car has had a lot of time and money invested. 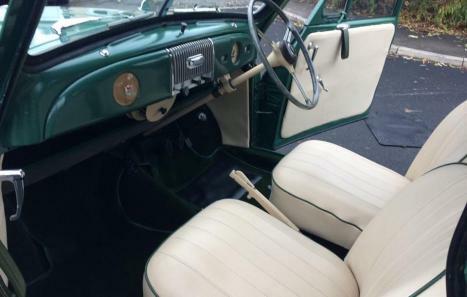 The interior is a great example of what can be achieved by a professional fitter with the upgraded cream seats and door cards restored along with the headlining and complimenting new green carpets. The dash was also repainted and the glove box with button operated opening is complete. 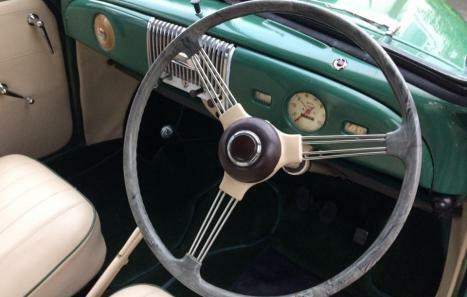 The mileage since restoration is around 1400 miles so this car has had very little use in the last few years. Outside, the car presents very well. The semaphore indicators are present (although not connected) and the recent tyres are as new with white wall detailing. The chrome is in excellent condition. The car has been repainted to a good standard and the trims on the wing joins have been replaced in fresh white rubber. It is believed to be repainted in the original colour of mist green. There are a few imperfections but we rate it as 8/10 and for a vehicle of this age it is very good. Underneath the bonnet the car is also in exceptional order. This area has also had a full repaint and the side valve engine has been detailed ready to show. Underneath the car it is as restored and finished in green - no underseal has been applied and the work done has been carried out to a very good standard. The brakes and brake lines are as new as are many of the other parts. No expense has appears to have been spared. This car was supplied from an estate where the gentleman is believed to have passed away and sadly there is no history with the car as it was lost. The Car Check Report however shows no issues and this is included in the sale. It did have an MOT in 2013 when it was returned to the road which it passed with flying colours. The log book showing only two owners from new is present. The VIN number matches but it is believed that the engine has at some point been replaced as the engine number is different - although it is the original specification side valve engine which gives a very vintage drive. The replacement engine has had a full rebuild and is barely run in. All the ancillaries such as fuel lines, fuel pump etc etc have been restored or replaced. ​This is a special car of which there are very few available and the cost of restoration at this level is huge. 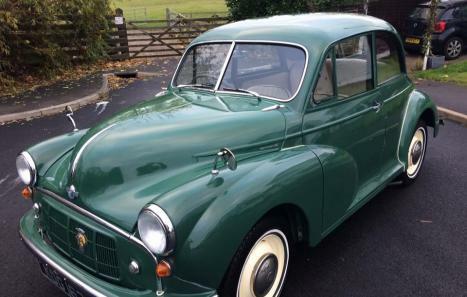 A definite investment vehicle - maybe the ultimate Morris Minor for the collector. We welcome viewings at your convenience please call 01371 499325 or email sales@barnesclassiccars.co.uk to arrange.